During the last week of June 2018, I was in South Africa working with a school as they brought focus to their interests in students-centered, discussion-based learning. 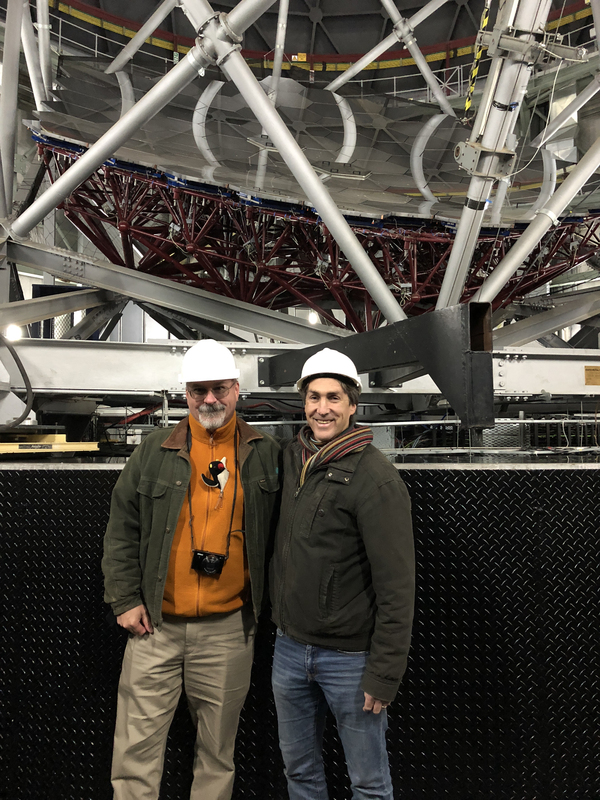 My host, Shaun Hudson-Bennett, a member of their Maths Department is a wonderful person and shared an interest in visiting the South African Large Telescope. 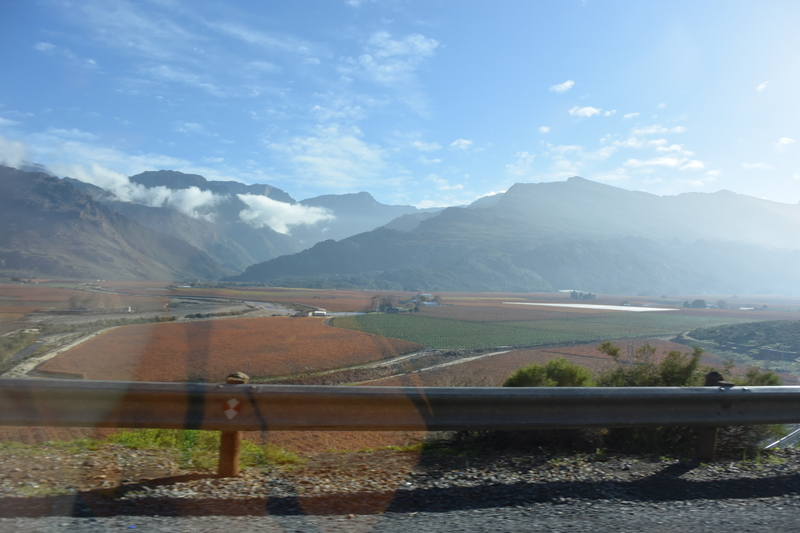 We were based in the town of Somerset just east of Cape Town… about a 4 hour drive south of SALT. SALT is located in the town of Sutherland in a region that is largely rolling hills and flat open terrain reminiscent of what we would call “high chaparral” here in the American West. Sandy and silty soil is mixed in with scrubby shrubs and prickly plants that all struggle to get water to survive. The geology of the area is lovely to behold: layered metamorphic and sedimentary mountains, and one can even find a volcano remnant. Much of the area is a fossil lover’s dream-scape. Heading out of Cape Town, one must first get through some of the mountainous regions. It is very colorful, even in winter, with grape arbors and other fields planted. Headed into the high chaparral nearing SALT. The rods are very straight for a good length of time. 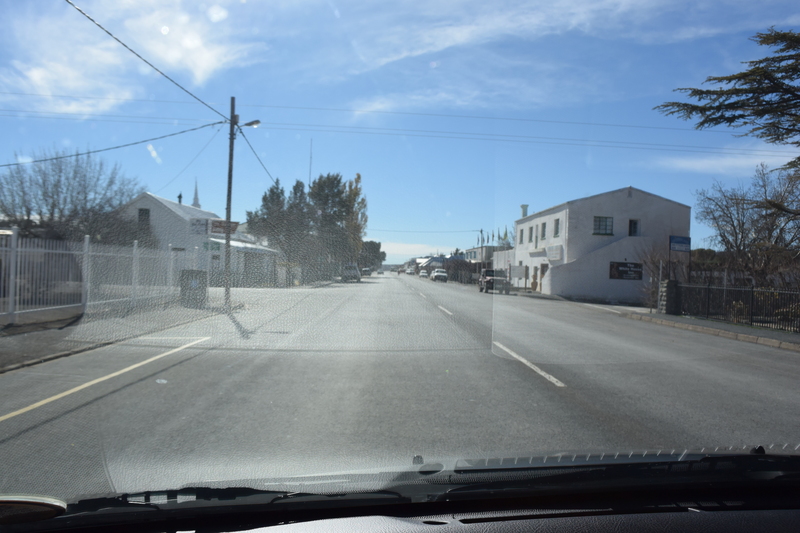 Entering the town of Sutherland. Lots of eateries and dark sky observing sites are available here. Some of the smaller domes on the summit. SALT itself is surrounded by what I call dark sky country: there are dark sky reserves in the area, and most businesses in the town of Sutherland are very much aware of the value of their dark sky commodity. Small bed-and-breakfasts are spotted throughout the town, each advertising their private star-gazing pads and fields. 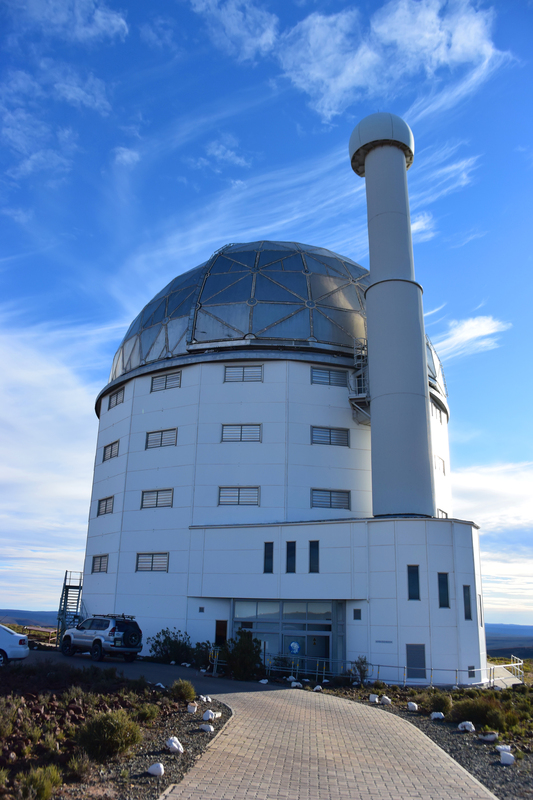 Climbing the road out of Sutherland, one arrives at the summit region of the South African Astronomical Observatory, home to SALT and quite a few other facilities owned both by South Africa and a number of other foreign consortiums (Japan and Russia to name but two). 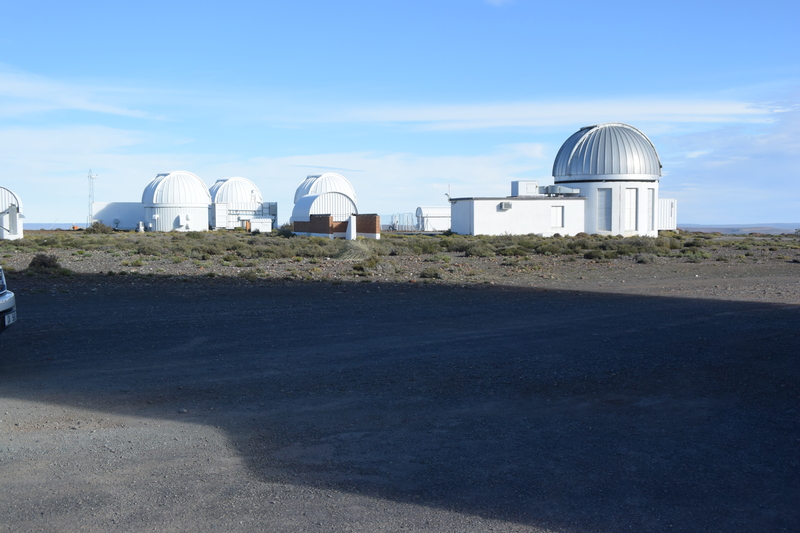 At 1798 m (5899 ft), SALT is well placed for its work, primarily spectroscopy. The air is not too thin, and walking around was easy enough. The SALT dome and alignment tower. 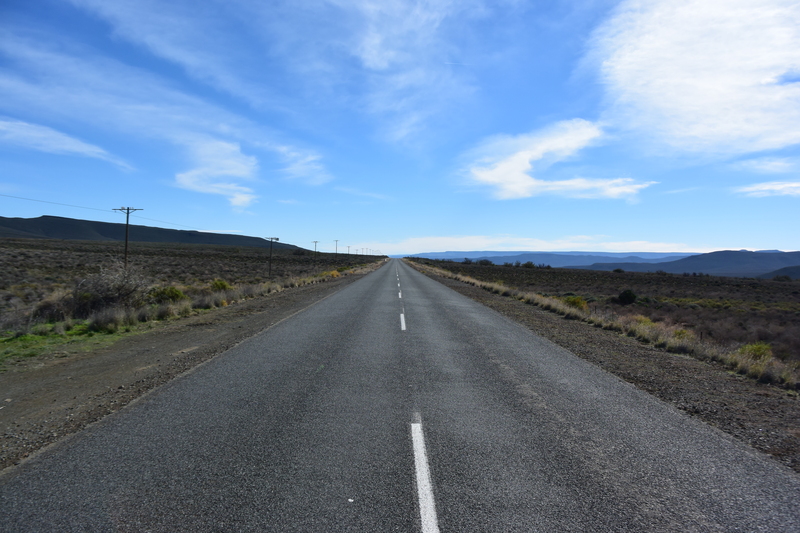 Location: Sutherland, South Africa in the semi-desert region named the Karoo. Altitude: 1798 meters (5899 feet). Optical Design: Optical with a total of 91 hexagonal 1m diameter mirrors making a composite 11m diameter hexagonal primary. First Light in September 2005. Robert Stobie Spectrograph (RSS) (née Prime Focus Imaging Spectrograph). The Berkeley Visible Image Tube camera (BVIT). Fiber-fed High Resolution Spectrograph (HRS). My host, Shaun (right), Frigid (the Penguin) and myself in front of the SALT primary mirror. The mirrors are very thin and lightweight. Combined they equate to an 11m diameter primary. The instrument payload package at prime focus (black painted objects). These move for tracking in both RA and Dec by sliding on rails. The optics of the telescope are most interesting. The system has a fixed altitude for the primary, so pointing and tracking are not done by moving the primary and all attached equipment, as is done with most other systems. At SALT, tracking is accomplished by moving the equipment package at primary focus. 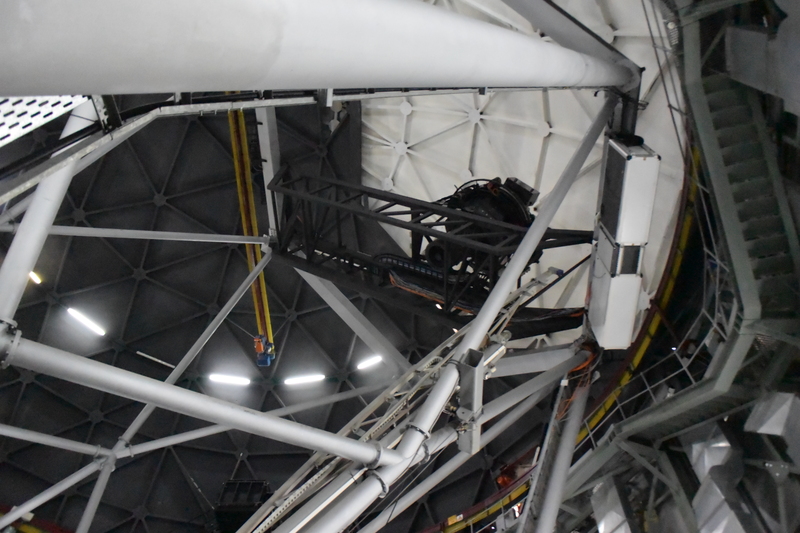 So, to image, the camera system is slewed across the top of the observatory as the target moves through the field. The telescope can be rotated in azimuth to view other regions of the sky. Each segment of the primary is adjustable using remotely controllable actuators. This allows the system to be aligned rapidly. Alignment is accomplished using what I call a collimation tower, an interesting structure that looms high on the outside of the dome. Essentially the telescope is rotated until the tower-top is at the center of curvature for the primary. 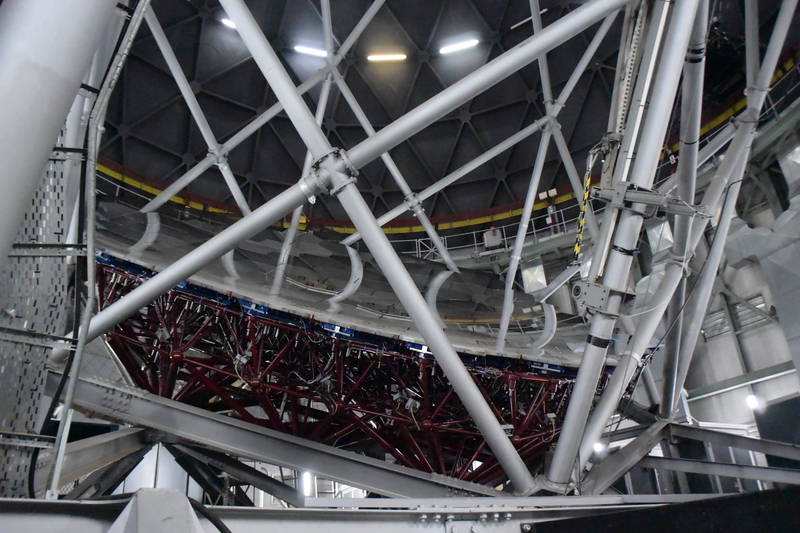 Each of the 91 mirrors of the primary are then tipped and/or tilted until they are precisely aligned to form a spherical primary system using lasers sent from the tower to each mirror on the primary. 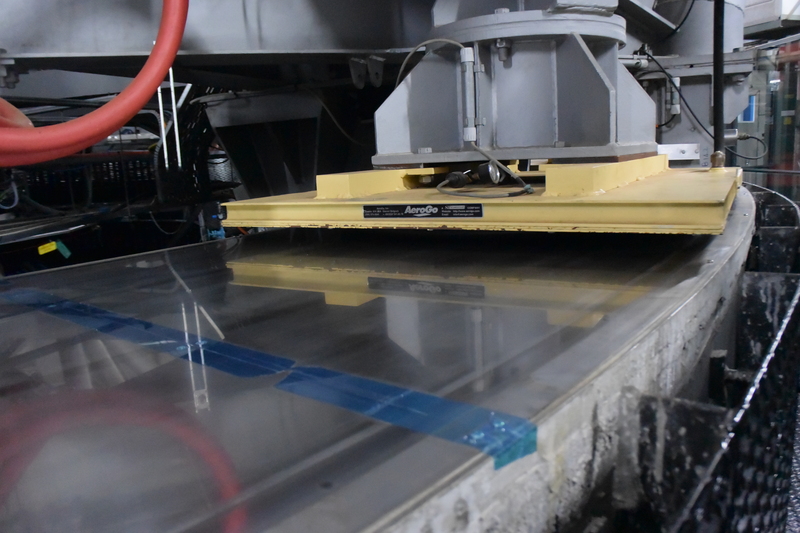 To maintain alignment, the whole structure is air-conditioned to maintain conditions as close to ambient as possible. The interior was pretty chilly the day we arrived, as it was winter there (in June). The whole telescope can rotate in azimuth on air-bearings like this one. Once aimed, the bearings are deflated and the telescope remains static throughout integrations. Only the instrument payload set moves during data capture. Another view of the massive primary assembly. This entry was posted in Astronomy, Travel and tagged Astronomy, observatory, SALT, south africa by John A. Blackwell. Bookmark the permalink.